Last year’s Taproom Christmas Concert was one of the year’s highlights. This year’s concert takes place on Saturday 19 December and we’ll be announcing the line-up shortly. For now, put the date in your diary and your feet in the starting blocks for buying tickets. 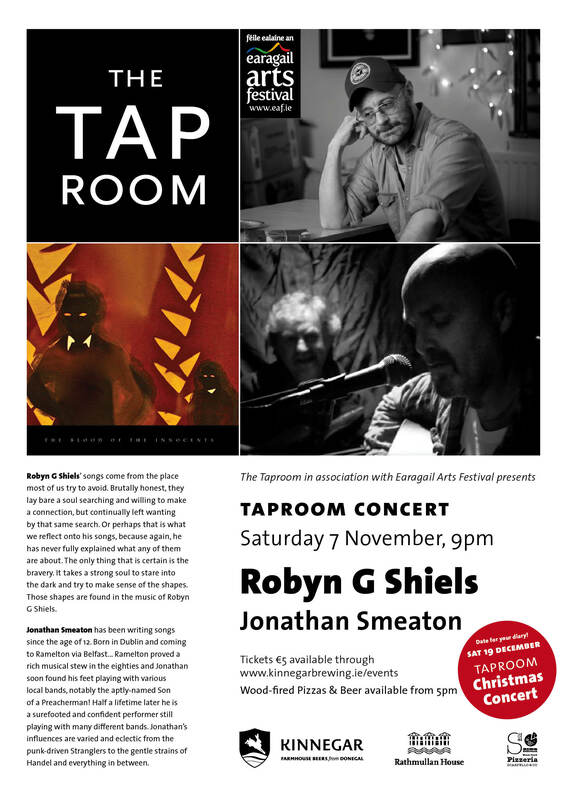 In the meantime, you can enjoy Robyn G Shiels and Jonathan Smeaton in concert at 9pm on Saturday 7 November. Neither artist needs any introduction and their performances in such an intimate setting promise to be special. Tickets cost €5 and can be booked in advance through our events page. Space is limited so book in advance to guarantee a seat. For those of you planning to travel to the event, our local taxi drivers, John Kelly (087 223 0533) and Columba Matthewson (086 270 7279), offer an excellent service. This entry was posted on October 18, 2015 by kinnegarbrewing. It was filed under Uncategorized .